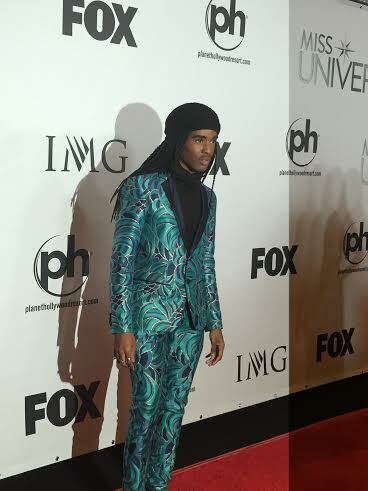 Ruba Wilson, pop culture and media journalist, arrived to the red carpet in a Trina Turk turquoise patterned suit. Looking fabulous, he approached me, and I was able to ask him a few questions. First, I asked him what message he wants to send to the teens watching Miss Universe, and he said “be yourself. Be yourself! There are so many people we see on TV and in magazines and we’re like ‘oh my god I wish I was like them, or I had their hair, or eyes, or whatever’. Be you. No one else can do you better than you. You know what I mean? Literally, I wear nail polish purposely because people think that guys are not supposed to wear nail polish, and I’m like, you know what? I do what I want. You guys will all see me in my crazy color nail polish. Don’t care what people say because most of the time they’re hating, and jealous, and wish they were as crazy as you. BOOM. Thank you.” He then snapped his fingers and laughed. Then, I told him that what he said is exactly what my mom says, so he turned to my mom and told her he loves her. He was one of the nicest people I have ever interviewed, and his personality was just outstanding. I asked if I could take a picture of him, but he suggested that instead we take a selfie together. Thank you Ruba, for being such an amazing person, and an inspiration to all.